Smart TV - Presentation and first use! The Smart TV provides access to all your online content. You have to choose a connection mode that matches the configuration of your home network. 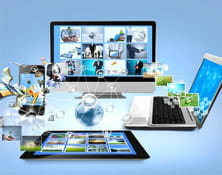 To take full advantage of your favorite online content, it is also possible to connect the TV with other devices, such as a PC or a tablet. Using Wifi:This is the connection mode that offers more freedom. It does not require cable. In the TV settings, enter the WPA or WEP key code on the home network, that is to say the password. The TV is then connected to your WiFi router! Using a cable: RJ45 cable and an Ethernet jack, allow a connection between the device and the home network. It is a connection mode that enables a more stable and higher throughput. The smartphone or tablet computer can be connected to the TV, provided they are equipped with wifi. Transform the tablet into a remote control: Download the specific app for your television brand and transform a touch pad or a smartphone into a remote control. This allows easier navigation and text input. Share contents: The DLNA standard, which equips the vast majority of Smart TVs, facilitates the sharing of files (movies, music, photos ....), between interconnected devices. Install applications: According to the manufacturer (Panasonic, LG, Samsung ....), each TV has its App Store. They are then accessible from the interface of the TV, that is to say, from the Home screen. VOD: Some brands possesses shows and movies via a dedicated portal. Published by jak58. Latest update on June 10, 2013 at 01:48 PM by jak58. This document, titled "Smart TV - Presentation and first use!," is available under the Creative Commons license. Any copy, reuse, or modification of the content should be sufficiently credited to CCM (https://ccm.net/). 3D TV - What are the required equipments, accessories..